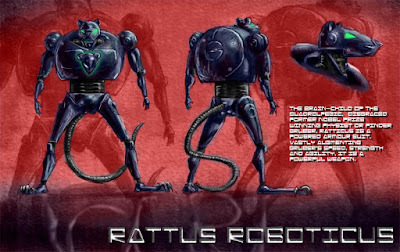 A small range of poses from my character Rattus Roboticus. Since Sorrel and I shall be drawing alternating panels of the fight between our characters, she will have to have a lot of reference of my character to be able to draw it accurately and consistently. These poses combined with the turnaround will enable her to have a quick source for reference when she is figuring out what'll happen next. This is the design for my character for the new collaborative blog BATTLE RATS. Sorrel Sparks and I have each designed a character and shall take it in turns to sequentially illustrate a battle between them. 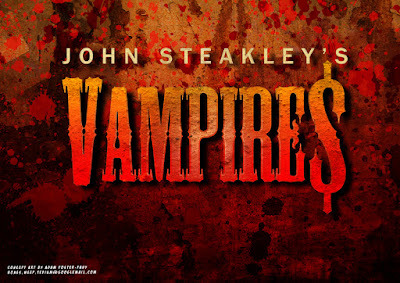 John Steakley's VAMPIRE$ is a phenomenally exciting book, which in 1998 was turned into the abysmal John Carpenter's Vampires. 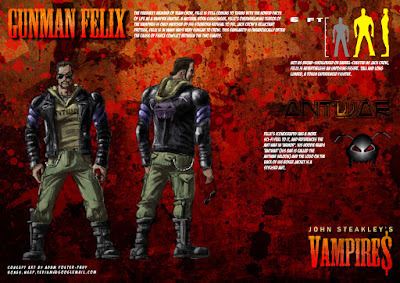 It is about a group of Vatican funded Vampire hunters, and their unenviable fatalistic lifestyles. Their lives fluctuate between bouts of superhuman alcoholism and nerve-shreddingly terrifying battles with superhuman Vampires. They all know that they're gonna die, and that when they die it'll be ugly and messy, but they also know that what they are doing is important, and once they have been let in on the secret that vampires are real they are all compelled to so something about it. Vampire$, Inc. is the Vatican sanctioned company that battles the undead. 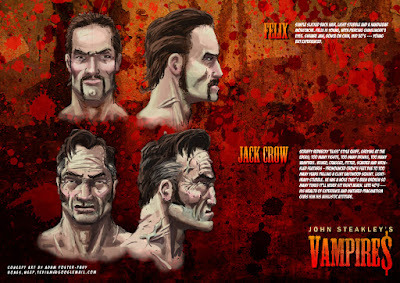 Jack Crow is the charismatic leader of Team Crow, the guys that Vampire$, Inc. send out to kill the vampires. Jack Crow is a magnificient character, larger than life and twice as mean. He has had an unusually long career as a vampire hunter (just over 2 years) and the knowledge that his luck is surely going to run out any day now gives Crow an unhealthy relationship with alcohol and a fatalistic attitude towards his life. 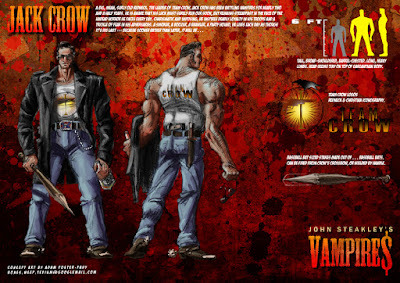 When battling superhuman vampires, Team Crow need to arm themselves as much as possible and hope that superior tactics and weapons and luck will win them through against the incredibly fsat and strong vampires. Covered from head to toe in chainmail and wearing a crucifix of halopgen lamps on his chest, Jack Crow going into battle looks like a modern day Crusader (apt, considering the source of their organisations funds). 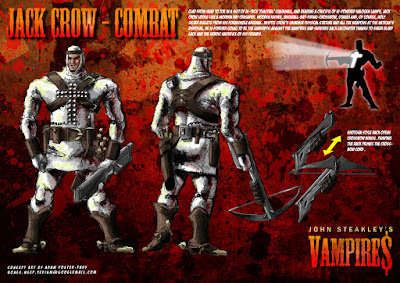 Crow's pump ction crossbow is apable of propelling his baseball bat sized stakes through the chests of vampires. The newest member of Team Crow, and Jack Crow's protege who he is seemingly grooming to assume leadership of Team Crow after his inevitable death. Felix is a natural born gunslinger, with all the superhuman speed and accuracy of a Sergio Leone character. He is a reluctant hero - torn between an overwhelming compulsion to run from the terror of the vampires, and a fundamental conviction that they must be destroyed. Headshots of Felix and Crow. In all aspects of designing these characters, I was trying to find a 'modern day cowboy' look.